Welcome to the newest member of Amelia and my family, our baby girl little cousin has been born on September 3rd 2015 - Twenty years my junior. For those who don't know, my immediate family (grandparents, uncles, cousins and aunts) on my dad's side are all really close, and we see each other weekly. She is my youngest cousin, the first to be born on my dad's side in ten years since the twins. Welcome to the world Anaise! We have a few possibilities for game release time. This can potentially lead to an earlier release than planned, or can lead to... well you guys waiting longer. We complete the demo and release it around October-ish without concerning ourselves with finishing the child chapter beforehand. after you guys let us know what you want, we complete the game and release. We can complete and release the demo on cue and release it. With your feedback we will complete the Child and Pre-teen chapters of the game. We will release those chapters for you guys to play through. When we finish the teen chapter, we will allow you to import your save file to the Teen chapter to continue playing. Finally, the two adult chapters will be released and we will release that as its own game. You can import your teen save file and the game will continue onwards. We will then release the game in full based on that. We do the same thing that we say above, except we release each chapter on its own. You will be able to have all the same items and friendships, you will just be given instructions on how to import/export your save. - You get the demo faster then get to glare at me while I slowly finish this game. - Full game will eventually come out without importing/exporting. - Gives you time to complete each chapter and have fun with it. - If importing/exporting the file doesn't work out, we have a backup plan. - I can focus on making each chapter really amazing instead of finishing fast. - It's possible for me to actually add-on to the game instead of importing/exporting, so you guys will be forced to save and go to the menu at the end of the chapter in waiting, then we can get you to download the patch, transfer your data, then BAM. You will load right into the next chapter. - I can add all the features I want in the game without skimping for time sake. - Most of my time will go towards getting the game known. - Tumblr and twitter will be my primary communication source. - You will be forced to wait to play the next part if you finish early. SO. With that said, guys, what do you think? Miss the old website? Never fear! All the old pages still exist. Even ones that have NOTHING to do with the game anymore. Pages that are of old features/characters/stuff that no one needs anymore. Only about... NONE of all sprites had been finished in game (The mini things that walk around) and I figured I'll see how I fare at making my own. Considering I want to change up the hero including her hair sheen and make her all around less flat-looking, I wanted to try this. I don't really know how I feel about it... I'll have to see them in-game. Either way, they look rather good, and I may use the template somewhere else. Damion's sprite drawn and animated by me. From the RMXP RTP. Used a generator to make this. I've got some good feedback on it, mainly positive. It seems to compliment the artstyle more, and I hardly have any sprites done. I've finished all of the template for both the child and teen sprites (buut I think I'm going to use the default child sprites :/). They animate nicely, it's just a matter of actually putting them to the test! It certainly matches my artstyle a LOT better. Really, it's no different time wise except for the last few steps to finish the template. Old Aris VS new Damion- we're extending the feet of Damion to be the height of the old Aris give or take a pixel. It's a short manga series that I've written for the game. 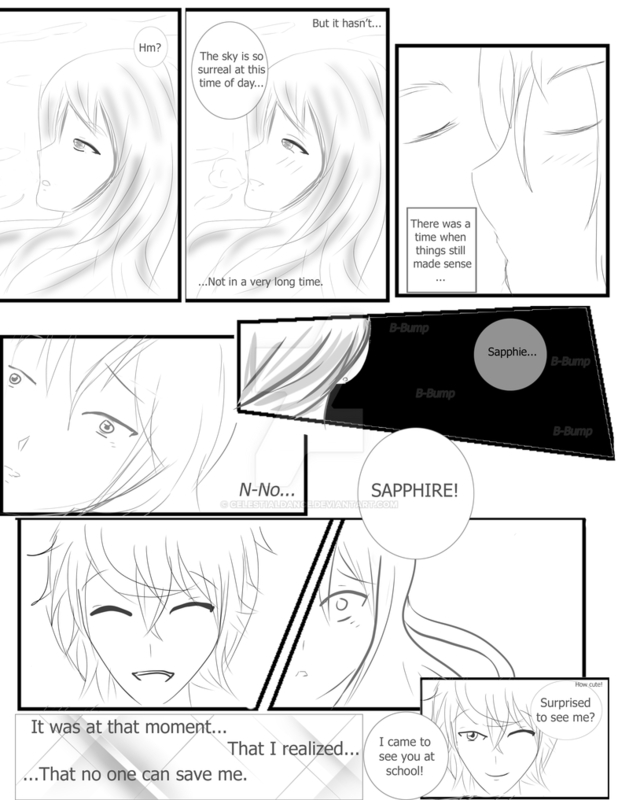 It consists of one page, and it took around an hour to do the full thing (mainly because I had to re-do Sapph's face 60 times (exaggeration, but still). I actually drew the first panel second, and there was an additional one, but the lines were too thick and didn't match with the rest of it. Sapphire was originally standing on a cliff looking out. The 'oh' was to transition to the main character, but I decided to keep Sapphs as the main. The boy looks a lot like Max, rest assured... it's not. I had to try in the last panel of him to make him loook less like Max, since I would be really upset if they got that likeliness. If I even do another page, you'll see why in-game. Out of the remaining characters that I don't play, Tai is probably my favourite female (maybe tied with Anastasia.) The himedere is beloved by all on the team, and probably rivals Cindy for my favourite non-OC female. Tai is hilariously sweet and carefully tsun-tsun while still remaining princess-like. It has become notable that Tai wasn't popular before coming to Araysia. It is also notable that her friendship with Anastasia is rather toxic to begin but Ana matures a lot. This is apparent by Ana frequenting the term 'accessory' when speaking about Tai. I'm so sorry you freaked out D: I was horrified myself when it happened! I had a feeling people were like "Oh Roxie -_-;;;"
Hehehehehehehee Back in the day, huh? That's totally fine! I sometimes forget about my own drawings hehe. I'm glad you think that it does add some realism! Hopefully it works together well in the game! Thanks for commenting <3 Have a wonderful day!! To be honest, I like 3 & 4 better, as I agree with all the pros you listed... I hadn't thought about it before, but I think an episodic release adecuates quite well with this game's format :). The sprites you made are 100 times cuter, really >w< I absolutely adore them and can't wait to see the other characters! You know what I think about food already xD I truly like that feature~. It's not fair! You can't just show us a page to hook us and then tell us you probably won't do another! xD. Aww, Tai is so cute <3 it's one of the girls I'm looking forward to meet :). P.D: I don't want to bother you, but did you receive my answer to your mail? I sent it on August 4th, I think. It's okay Roxie :D I understand why you did though, if it makes you feel better, I also panic when I'm under pressure or stress in similar situations. Yeah I do like everything! I'm easily pleased by things I like and Celestial Dance has pleased me and made me extremely happy and excited! Yup, and yeah hehe! I really do have a bad memory at times but then I'll remember random and unimportant facts that little to no one remembers, lol! Yeah, it does I mean I remember some games where it took forever just to pass out or die in a game. It'll definitely work together! Roxie, I know that the game will be amazing and wonderful! You put so much effort and time into this game that it will be amazing and wonderful! Plus, you make sure that your fans have input and you care about your fans and you give them the ability to make many different choices within the game. To me that already makes Celestial Dance an amazing game! In my opinion Celestial Dance: Shift the Tides is one of my top five favorite games with it at first place! Have an amazing day and week Roxie <3!